Canton DM 90.2 review | What Hi-Fi? The Canton DM 90.2 brings a no-nonsense approach to soundbars. It’s an imposing, if unadventurous design: think a small floorstanding speaker laid down on its side. It weighs a hefty 17.5kg and, at 30cm deep and close to 15cm tall, you might struggle to place one of these and a TV of the same shelf space. Then again, you could always place your TV on top of it. Canton actively encourages this and suggests the DM 90.2 can take a weight of up to 80kg. This should easily withstand your average 55in flatscreen and we’d suggest giving it a go, as the Canton sounds at it’s best when it isn’t sandwiched between kit-rack shelves. The DM 90.2 has eight drive units: four 10cm aluminium woofers, two 5cm midrange drivers and a couple of 25mm tweeters. It’s rear-ported and total power is a sizeable 350W. Unfortunately the Canton doesn’t have any HDMI connectivity or streaming ability. Digital inputs are limited to a couple of optical and a couple of coaxial connections. There’s scope for decoding Dolby Digital and DTS soundtracks but these connections don’t carry full-fat high-definition audio. There are also two sets of analogue inputs and a subwoofer output for those who want more bass. The Canton DM 90.2 offers a handful of sound modes: Stereo, Wide and a couple of virtual surround settings. Wide stretches the soundstage but sounds uncomfortable and unnatural. The surround modes allow effects to creep further along the edges of your listening position and, to its credit, the Canton does this and still manages to keep the soundfield solid and cohesive. As is the case with the vast majority of soundbars, pseudo surround settings are no match for a dedicated home cinema system, but the Canton doesn’t disgrace itself. Play a blockbuster Blu-ray, crank the volume and the DM 90.2 hits the ground running with its robust and exciting sound. Push it harder and it refuses to turn hard and aggressive. It passes the explosion test too, with a weighty and powerful thud, although the likes of the Sonos Playbar and Sub system can outmuscle it. Spin Adele’s Someone Like You and there are good dynamics to her vocals and the piano. Each keystroke is well-defined, but there’s a hint of colouration and a hollowness that robs the arrangement of its natural tone. This doesn’t make for the smoothest or most delicate of sounds, but the Canton captures enough of the essence of the music to keep you listening. The most frustrating aspect of the Canton DM 90.2 soundbar is its remote control. 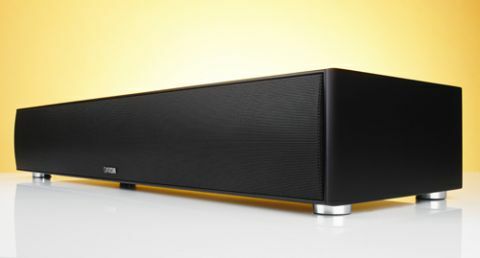 It looks cheap – like something you’d use to control a boiler, not a £1100 soundbar. There are too many buttons, and the menus are too confusing, even though there’s a screen on it too. The remote for a product of this type should be much more intuitive. That said, at least it’s more substantial than the ‘pebble’ supplied with the £1650 Bowers & Wilkins Panorama 2. For the money, and compared with rivals at this price, the Canton DM 90.2 is a good performer. It’s entertaining and we can hear lots of potential; we’d just like more refinement.